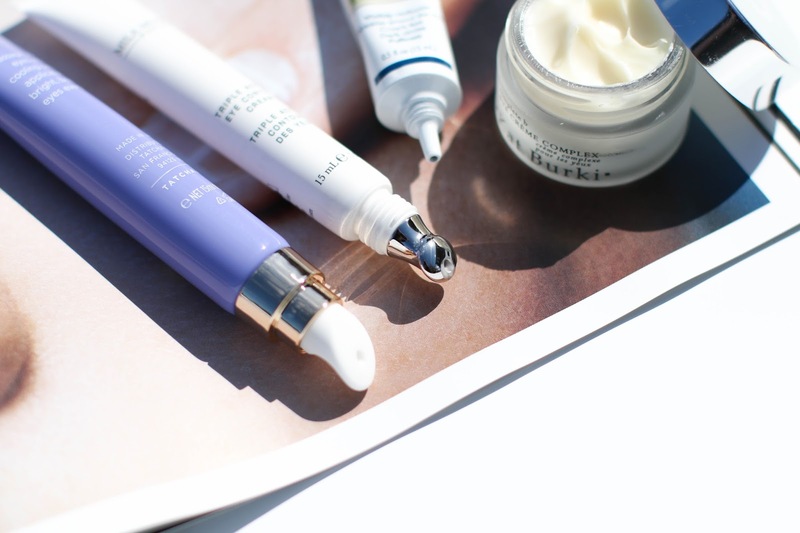 It's been quite a while since I reviewed any eye creams on my blog, so I decided to round up 4 that I have been using frequently over the past 6 months (some the past 2-3 months). While I love skincare, I try not to frivolously review products like eye creams and serums without giving them a full 6-8 weeks if not a few months to really decide a). if I like it and b). if it does what it claims to do. As I have said before, cleansers and masks deliver results much quicker so I review them more often. Eye cream and serum reviews will always be few and far between but nonetheless when I find ones I enjoy, I want to share my experience with all of you. 1. Kat Burki Complete B Eye Creme Complex - Though I don't necessarily need a rich and thick eye cream every day, I like to have one in my routine if my eyes need extra TLC. 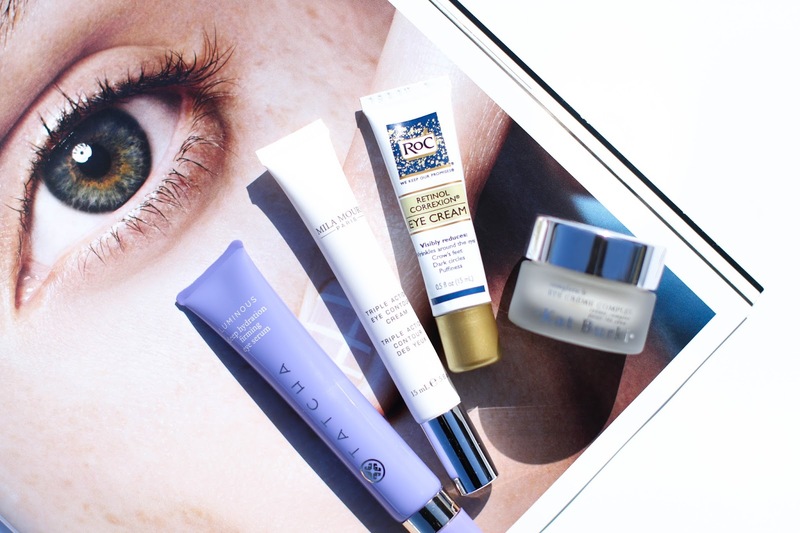 I wake up often with dry eyes and if my skin is acting particularly sensitive, I like a rich and comforting eye cream. This one from Kat Burki is one of the richest eye creams I have tried in a long time, yet I didn't find it to be heavy or greasy. While not only nourishing the area, it is designed to help address any hyperpigmentation or uneven skin tone around the eye. I don't have significant crow's feet, but on certain days they are more apparent. #rude Typically when that is the case, I break out this eye cream and begin using regularly to help smooth that area. 2. Tatcha Luminous Deep Hydration Firming Eye Serum - While the Tatcha Ageless Revitalizing Eye Cream has been one of my favorites for a long time (at least 3 years), it can occasionally give me milia. I find that richer eye creams normally do this to me so I will switch back to a serum or very lightweight gel for a few weeks or month and the milia begins to go away. I found that my milia slowly began disappearing after using this Tatcha Deep Hydration Eye Serum for a few weeks (there is still some there but it has reduced significantly). Stay tuned for my mom's upcoming skincare post, because she had a similar experience using this serum! You can layer this under another eye cream, but I like to use it alone. The applicator is amazing for massaging around the eye and I notice that my puffiness disappears after 30-60 seconds of using this. The formula is intensely hydrating and brightening (there is 23-karat gold powder mixed in #fancy) and feels virtually weightless on the skin. If I don't drink enough water during the day, the first place I notice it is around my eyes. They begin to look crepey and my fine lines are more pronounced. However, when using this Tatcha serum day and night, the hydration under my eyes lasts much longer so even if I am dehydrated, my under eye area still looks fresh and smooth! 3. 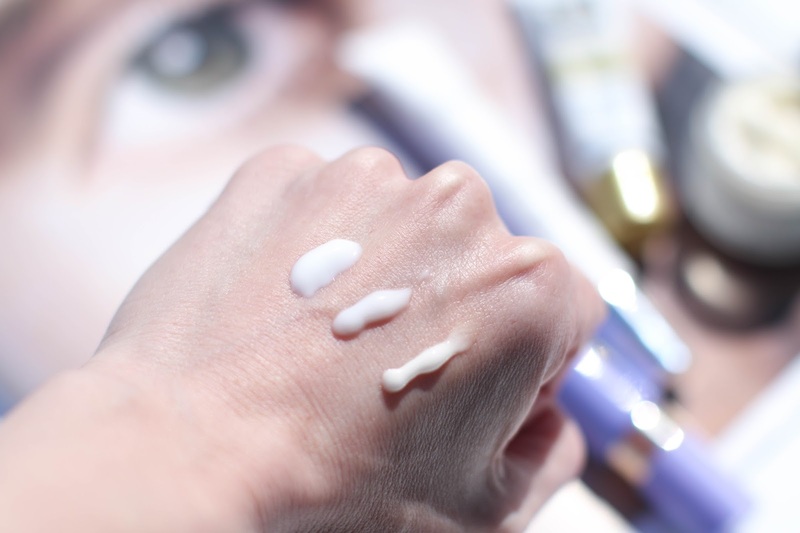 Mila Moursi Triple Action Eye Contour Cream - I do love the Tatcha applicator, but the Mila Moursi has the added benefit of feeling much cooler on the skin as soon as applied. Though it is labeled as a cream, it is more of a gel texture and absorbs a few seconds after it's on the skin. I prefer to use this in the morning because I find that my puffiness goes away quickly, the area looks smoother and my makeup applies perfectly on top. If you are new to the Mila Moursi line, I highly recommend trying the eye contour cream, this toner, this lotion and this cleanser (it's one of the few foaming cleansers I enjoy). 4. Roc Retinol Correxion Eye Cream - I LOVE retinol in my face products, but do not use many eye creams that contain retinol. Though my skin is not easily irritated, I was worried whether having such a strong active ingredient close to my eye would be the exception. However, I was up for the challenge when Roc sent this over for me to try. The texture falls in between a rich cream and a thin gel, which appealed to me instantly. Thankfully after using it for many weeks, I had no averse reaction nor any irritation. In fact, I noticed a fading of a few dark spots near my eye and my eye area always looked firm and taut after applying. For those of you that react easily to retinol, there is a sensitive skin version that may be better suited for you. 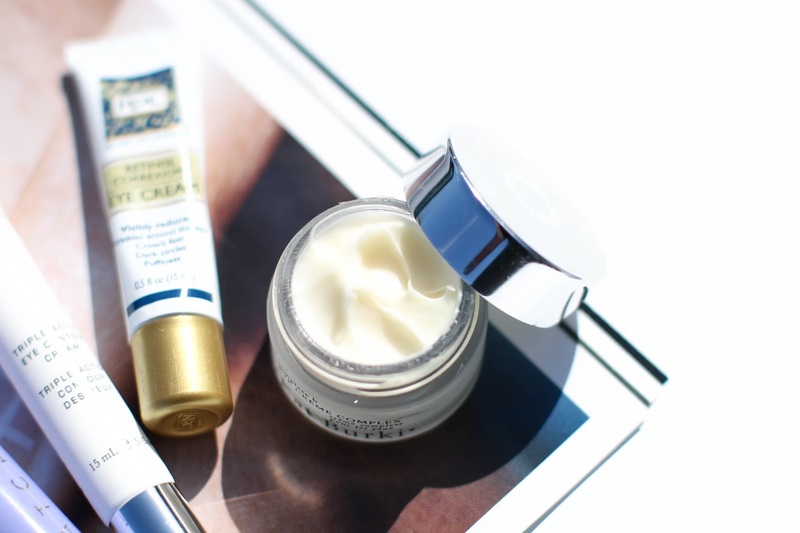 Eye cream is my obsession, so I love reading round ups like this! Thank you for sharing.